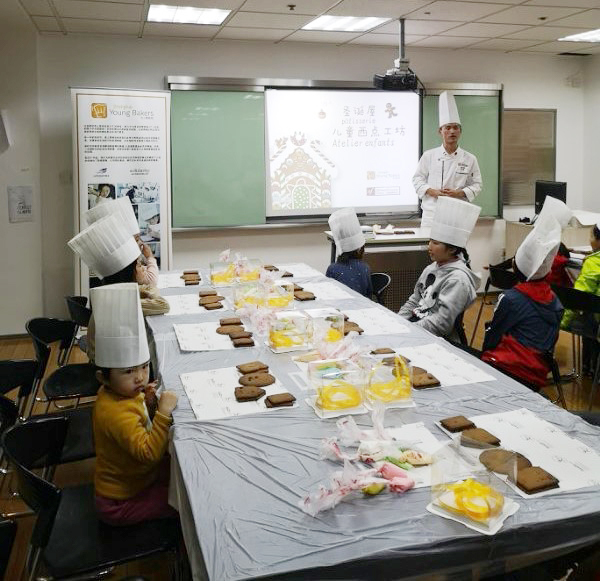 On the afternoon of December 22nd, Shanghai Young Bakers held a Christmas baking activity for children at Alliance Francaise on Wuyi road. 19 lively and lovely children and their parents participated in the activity. 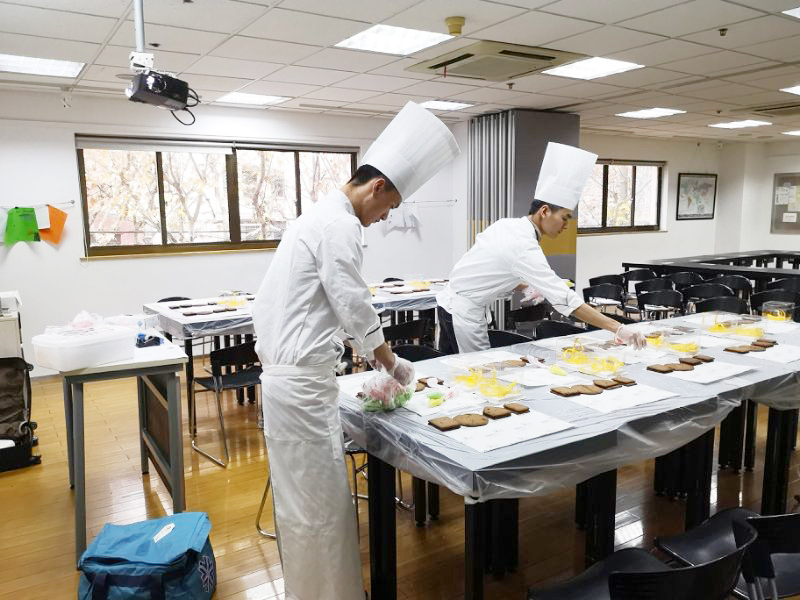 This baking activity is led by Liu Dong, our bakery teacher who has returned from his study in France, with the assistance of Sun Jinfeng, one of our 10th batch graduates. The teachers designed an interesting and beautiful Christmas gingerbread house for the children to make. After lunch, the teachers arrived at Alliance Francaise to start the preparation work: folding the boxes, placing the ingredients, setting up the classroom, and distributing in advance the biscuits and frosting needed for making the gingerbread house. 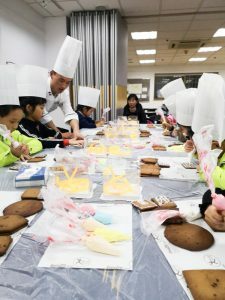 At 3: 30 in the afternoon, after the children arrived, Teacher Liu and teacher Sun carefully helped the students to put on their chef’s hats first. 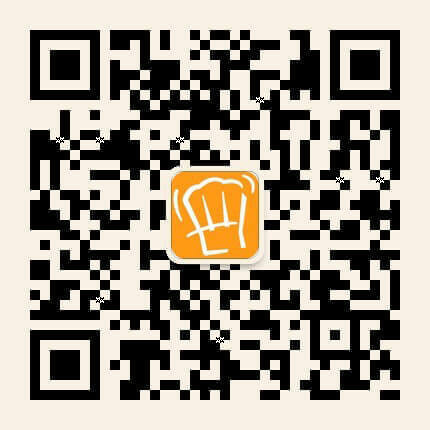 Wearing a white chef’s hat, everyone looks really professional. After completing all the preparation, teacher Liu Dong first introduced SYB and the arrangements for the day. Then the children were shown how to decorate the gingerbread and how to assemble the biscuits into a beautiful gingerbread house. They listened very carefully and asked many interesting questions. For example, they were wondering whether the gingerbread house has a chimney, as the Santa Claus need to go in from there. After the teachers demonstrated, the children began to work on their own. They showed great levels of concentration and carefulness, filling the room with joyful laughter. Teacher Liu and Teacher Sun also gave one-on-one instructions to each participant. An hour and a half later, everyone had completed their own unique gingerbread house, happy about their work and achievements, the children were all excited about taking photos with the teachers and their work. 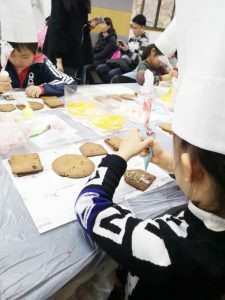 At the end of the activity, they carefully packed their gingerbread house, feeling cheerful and satisfied. Alliance Francaise has been providing free French training for SYB staff for many years. We are very grateful to Alliance Francaise for their support and assistance to SYB, and for organizing this wonderful baking activity!